are changed. Wear and corrosion resistant. High security vault. Large captured ticket capacity. Extremely fast. Exceptionally low maintenance. Extremely long service life. 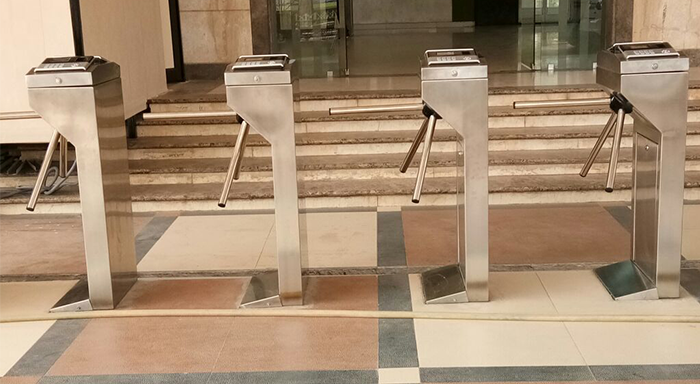 Designed for the look of modern automatic fare collection systems. Three rotor sections provide a comfortable passage while still maintaining high security performance. Units are available with mechanical or electrical operation, in either one or two way operation, with any combination of fail lock or fail secure. Drop Arm When a signal come through the alarm input of the turnstile, the arm folds. When alarm signal cut down, the arm comes back to normal position.